Worrying about choosing the right speakers to match the aesthetics of your room is certainly a first world problem, but that doesn't make People People's transparent speakers any less lustworthy. They need to get these into production ASAP. 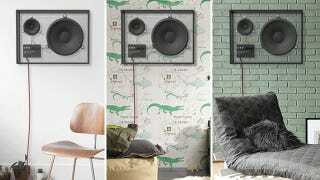 First and foremost it was created to be a stylish alternative to most home stereo eyesores, camouflaging itself into any setting by simply letting the existing decor of a room show through. But its creators also wanted to come up with something that minimized electronic waste. So only the speaker cones, electronics and framework are shipped. The glass panels used in its construction are sourced locally, so the extra padding and packaging needed to safely ship them are minimized.